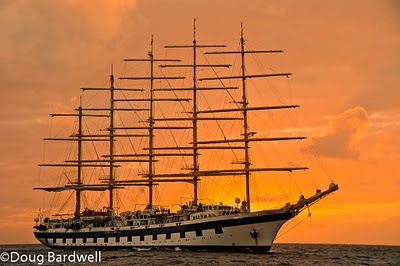 Star Clipper is a boutique line with only three vessels, but they are renowned as best-in-class when it comes to sailing ships. Service is top-notch. Food is phenomenal. Activities and amenities rival those offered only on private yachts. Cabins are exquisite. Ports of call are unique and delightful. Passenger count is 227 or less. 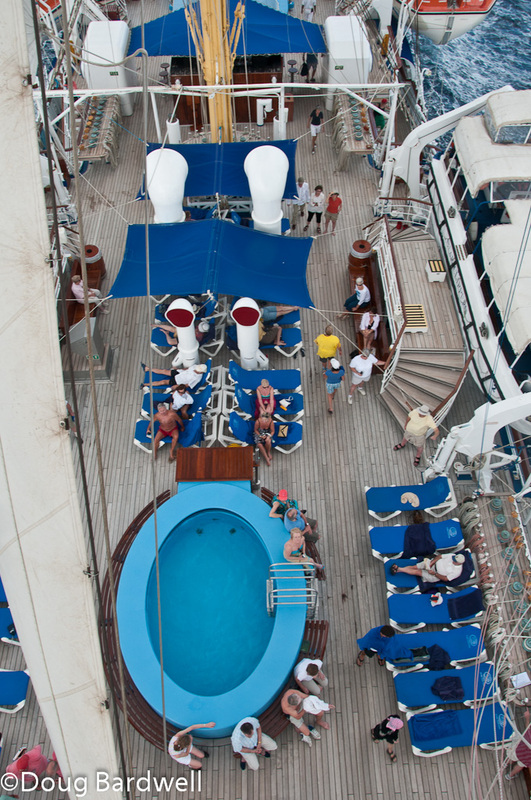 Plus, the ships themselves are gorgeous to behold, whether on-board or viewed from on-shore. 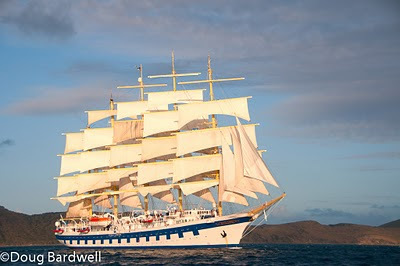 The Royal Clipper is their flagship and is presently sailing the Leeward and Windward Islands of the Caribbean. It is the world’s largest square rigged clipper ship. Later this year, it will head east and spend the summer sailing the Mediterranean, including a special sail where they will dock for you to watch the Monaco Grand Prix. I say sailing, as opposed to cruising, since these are actually sailing ships. 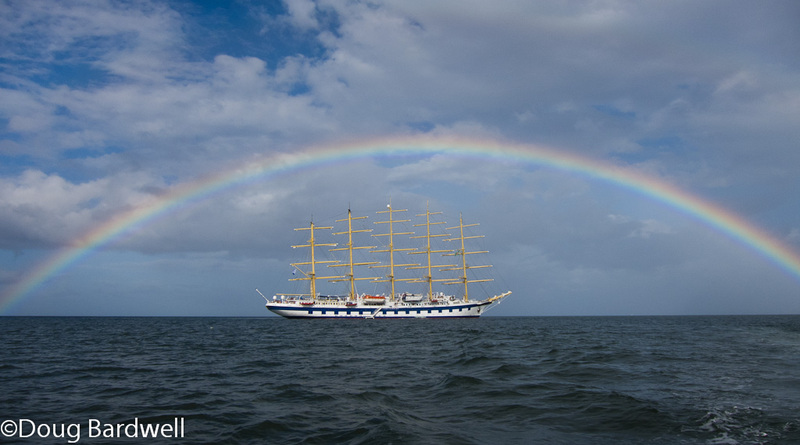 With almost 50,000 square feet of sails (that’s 42 sails on five 54m tall masts,) the Royal Clipper gets a tremendous boost from Mother Nature when they are all unfurled. 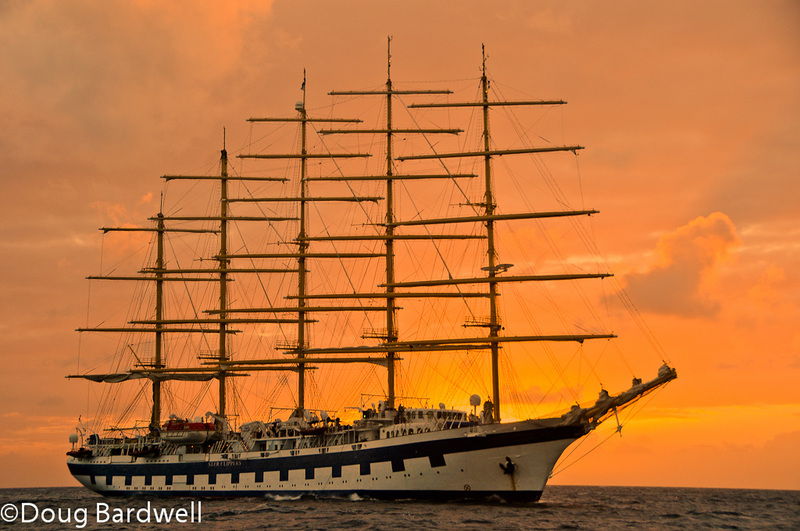 Unlike other so-called sailing ships, that run on motor assist almost constantly, the Star Clipper line uses sail power as much as possible when conditions are favorable. Being a true sailings ship, you will notice the motion as you travel. Depending on your personal tolerance for motion, that is something to consider. Personally, I found that most passengers had no problems and the ones that did, quickly found a remedy that allowed them to enjoy the balance of the trip. So what can you expect on a typical sail? Following are the observations from seven days at sea on the Windward Islands tour on the Royal Clipper, taken in February 2011 with my wife. Described as a “luxury casual” cruise, this suited my lifestyle perfectly. Shorts during the day and slacks with a polo shirt for dinner. No pretense…no worries. My kind of living. Meeting the boat required a flight to Barbados where the ship was docked. Passing through customs was a breeze and we were met by a cruise-arranged shuttle van that took us to the dock. Boarding in the early afternoon gave us time to unpack in our cabin and get acquainted before we left port around 10 p.m.
Our cabin was mid-ship and was a warm blend of mahogany and brass accents. Two single beds were arranged together for us as a queen-size bed. Evening turn-down service even placed a couple signature chocolates on our pillows each night. The closet was quite adequate with a couple nicely built-in shelves near the floor for shoes and sandals and a full- width shelf above the rod. A couple dresser units held everything we didn’t need to hang. A separate desktop (with safe below) made an ideal worktop for my computer and photo editing. A small stool was just the right height for typing. The restroom was completely marble - both walls and floor, with a spacious vanity and two full-width shelves below. Under the bed, there was a mammoth amount of space to store easily much more luggage than we brought for the trip. Two large (maybe 18” diameter) portals were our windows to the world outside. Thick draperies allowed you to block the sun if you wanted to sleep in. The ship is five decks tall and multiple sets of stairs make it easy to get from place to place. There are no elevators. 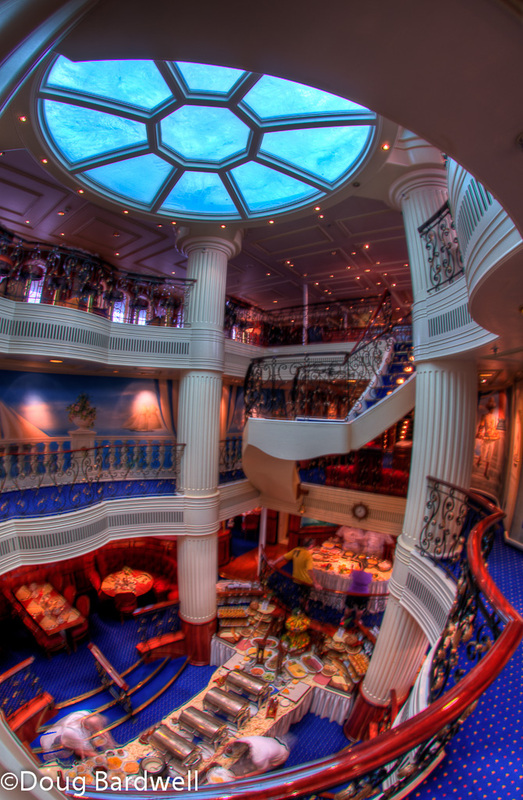 The main dining room is center ship on the second to lowest level and has a three story atrium of sorts. 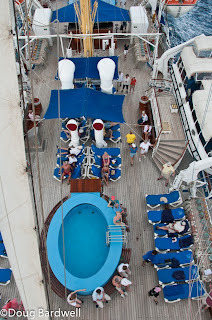 The skylight is actually the bottom of the center and largest of three swimming pools on the Sun Deck. Sunlight filters through the water and floods the dining area below with a soft, cool, shimmering effect. 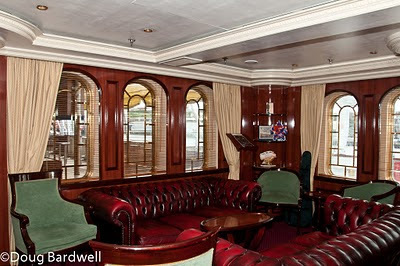 Breakfast and lunch are usually served buffet-style in the large dining room on the Commodore Deck, although on occasion it was served on the main deck outside in the Tropical Bar area. Another afternoon, lunch consisted of a beachfront barbeque. Every evening for dinner, there were four new entrée choices: usually a seafood dish, a meat dish, a Caribbean specialty and a vegetarian dish. Every evening, you also had your choice of steak and fries, a pasta dish or a consommé if you chose. In every case, the meals were beautifully prepared and passengers had nothing but praise for executive chef Devon Hodges and his staff. Dinners were always served as a sit-down affair with waiters and wine sommeliers attending to your table. Reservations were never required. Each evening, the Maitre d’ would offer the option of a private table for your group or the opportunity to dine with some of your fellow passengers. Tables could be had for 2, 4, 6 or 8 guests. The passengers on our cruise were evenly mixed from a variety of countries, primarily England, Ireland, Germany, France and Canada as well as the US. I felt hopelessly language lax as everyone else spoke decent English in addition to their native language. Our head waiter Clifford had the uncanny knack of knowing who to place with whom for interesting conversation. The variety of cultures made for delightful evenings and new friendships. In addition to the three main meals of the day, there was also early-bird breakfast in the piano bar starting at 6 a.m., an afternoon snack and a midnight snack. No one ever went hungry on a Star Clipper’s voyage. Coffee and tea were self-serve 24 hours a day in the piano bar. After dinner, there was always some activity planned by Angela, our effervescent cruise director. A wildly popular steeldrum band joined us in Antigua, while other nights there were talent shows, crab races on Pirates Night, and always dancing to live music. Captain Sergey Tunikov always kept an open-door policy on the bridge and everyone was welcome to stop up any time and tour the chart room. If you were so inclined, you could take the giant wheel to steer the ship or help with the lines while sails were lowered leaving port. Each sailaway was accompanied by the overture from the movie 1492, (Conquest of Paradise by Vangelis) playing on the loud speaker system. Seeing the sails unfurl, feeling the increasing sea breeze and listening to the music created memories all the passengers will long remember. If you are into snorkeling and scuba diving, you'll be in heaven on a Royal Clipper sail, as there are free opportunities at every stop, along with Sunfish sailing, kayaking, windsurfing and water skiing. There’s no additional charge for any of the beach activities. If you are a real sea person, hook up with Mariano, the on-board marine biologist. He's a wealth of information and a great scuba leader. Sailing out of the port in Martinique , we had an opportunity to climb the mast and hang out on the crow’s nest That was a tremendous opportunity for a birds-eye view of ship. I was surprised how steady I felt 50' in the air as we sailed off into the Atlantic. We also had a chance to board two of the tender boats and run parallel to the ship as it left St. Kitts under full sail. I got some of my best photos during that excursion. We went out just before sunset, so the lighting made the ship’s canvas come alive with a warm golden glow. In each of the ports, (we stopped at seven) there were optional shore activities, both free and at extra cost. See my accompanying article (Seven days – seven ports) for a description of some of our shore adventures. Cruise director Angela was a wealth of knowledge when it came to planning just the right shore excursion. If staying aboard is more your thing, there were plenty of places to hang out from the beautiful Edwardian style library to the spacious piano bar. Internet is available in the Observation Lounge. Deck chairs were always available in either the sun or the shade on the sun deck. For the ultimate tan, you could climb out onto the bowsprit nets and sunbath alongside the sensuous ship’s figurehead. Three pools were available for leisurely soaking or for taking scuba lessons. Way down on the lowest deck was Captain Nemo’s Gym and Spa where you could work out or get a full variety of spa services. While some of the above-mentioned items could be experienced on any mega-cruiser, there was something magical about experiencing it on this great steel-hulled clipper ship under full sail. The magic was so captivating that many of the passengers were sailing for their fourth, fifth or sixth time. That speaks volumes in my book for the quality and allure of these trips.